Wow - it has been over a month since I added a new recipe to the blog! I cannot believe it. This past month has been a whirlwind, starting with my trip to Peru at the end of September. It was an amazing experience and I’m working on editing my photos so I can hopefully (fingers crossed) put together a guide soon. I will say these two things: Machu Picchu is incredible and a life changing experience, and altitude sickness is not fun at all. After returning from Peru, I had three days of work and then I was off again to New Hampshire with my sister. We booked a Getaway House for a weekend in the woods and after 7 days of being on and off trains and airplanes, being in solitude with no Wi-Fi, a good book, s’mores, and campfires was much needed. We also LOVED our experience at Getaway House and would definitely recommend to anyone thinking about it! Now that I’ve been back in the city for the first time in what feels like weeks, I’ve been trying to take advantage of the great fall weather. It’s only just started feeling like fall here and while I miss being able to just walk outside in a dress, when I put on a sweater this weekend for the first time in months it was kind of nice! Plus, I’ve been enjoying a homemade matcha latte and a lot of cozy candles this weekend. It’s that time of year again - the Virtual Pumpkin Party! This time I pulled a trick out of the old family hat - cheesecake. A good cheesecake is a must have in my family. It’s the dessert my mom makes for every single holiday (and the most requested one) and over the years I have been making a cheesecake as well! 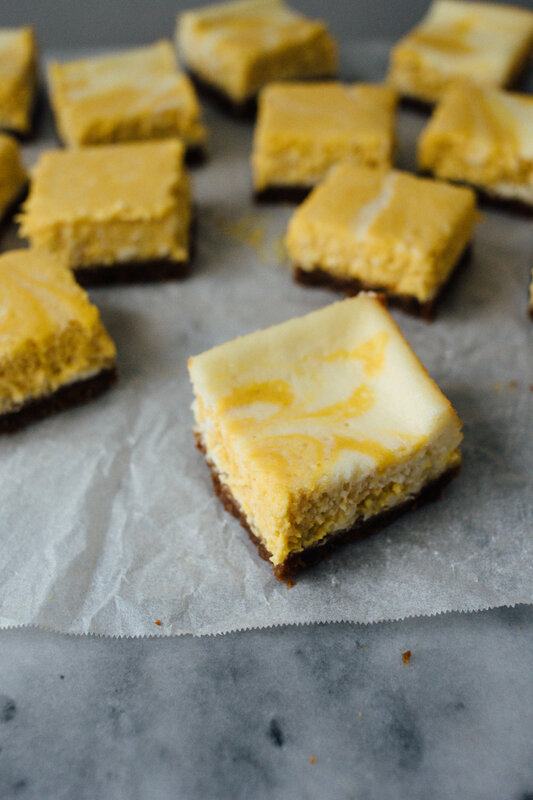 These pumpkin cheesecake bars are easier to eat than regular cheesecake - they are practically bite size! AND the pumpkin adds a nice seasonal touch. Check out the rest of the fab here! Preheat oven to 375 degrees F. In a blender or food processor, mix graham crackers together until smooth small crumbs form. Add in cinnamon, flour, salt, and melted butter. Continue blending until smooth and set aside. Line a 8x8 inch baking dish with parchment paper and pour in crust mixture, using the bottom of a measuring cup (or something similar) to smooth it down. Put the tray in the freezer for 10 minutes, and then transfer it into the oven for 10 minutes until it’s set. Remove from the oven and let cool. Reduce the oven heat to 325. In the meantime, in a large bowl mix together cream cheese and sugar with a hand held mixture. Add in eggs, vanilla and Greek yogurt and continue blending until smooth. Take 1 1/2 cups of the cheesecake mixture and pour it into a separate small bowl. In the separate small bowl, stir in 1/2 cup of canned pumpkin and whisk until smooth. Carefully pour the pumpkin-less batter into the baking dish over the crust, smoothing it until all edges are covered. Then, gently pour in the pumpkin batter over it, swirling the mixture with a spoon or fork. 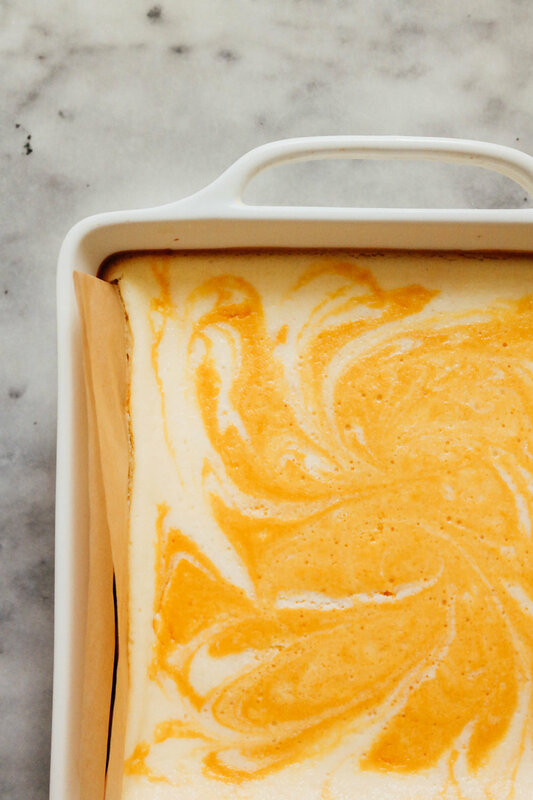 Bake for 35-40 minutes until the cheesecake is set (but still JUST wiggling in the middle). Remove from heat and let cool to room temperature. 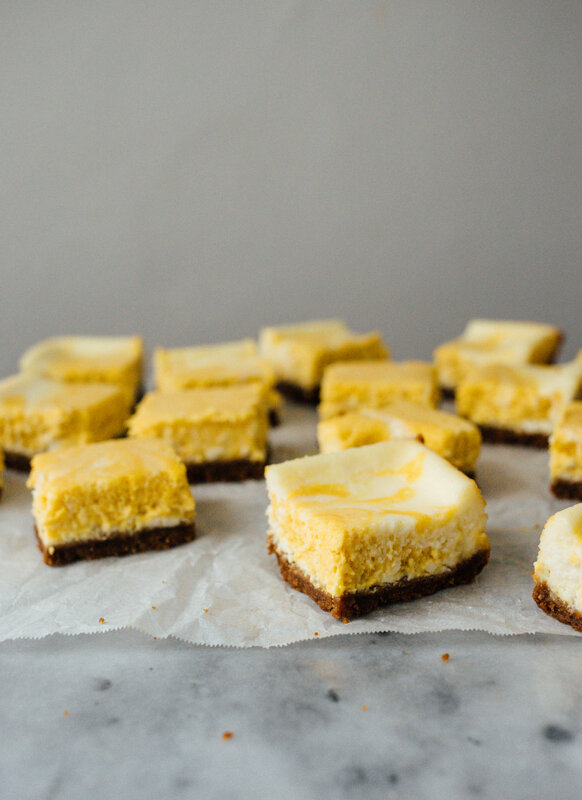 Refrigerate for a couple hours and slice into squares to serve.